What, you might ask, is Nehrim? 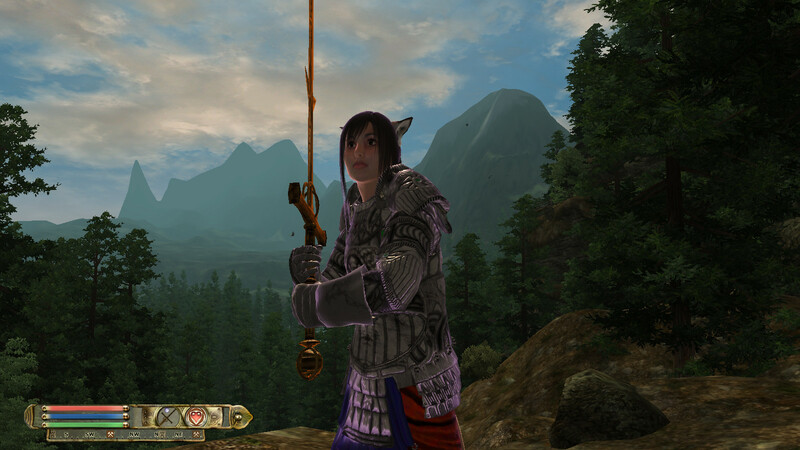 It's a total conversion for Oblivion that's so huge that it really is a whole new world. If English is your only language, be prepared to do a lot of dialog subtitle reading; this project was created in Germany thus all the spoken dialog is in German. Apart from that minor language barrier, I've quite enjoyed playing this mod and have been quite impressed. I hesitate to call it a "mod" though; as I said, it's a "total conversion" and as such is virtually an entirely new game. There of course are some differences between Oblivion and Nehrim. 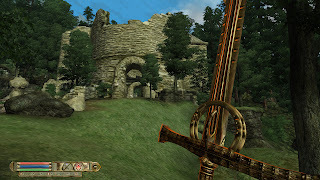 Level advancement is handled by experience points, for example, and many encounters, dungeons and quests are set at static levels rather than changing with the player's level as they do in Oblivion. Which brings me to my little Nehrim mod. By default in Nehrim you can't fast-travel... EVER. Thus I created a simple little Nehrim fast-travel mod which enables you to do so once you've "discovered" a location (like in Oblivion). As mentioned above, I've updated the mod so that it will now work with the latest Nehrim version. Apart from such differences in gameplay mechanics, some things will look and feel familiar. Old forts, caves and towns, for example, really aren't so different. 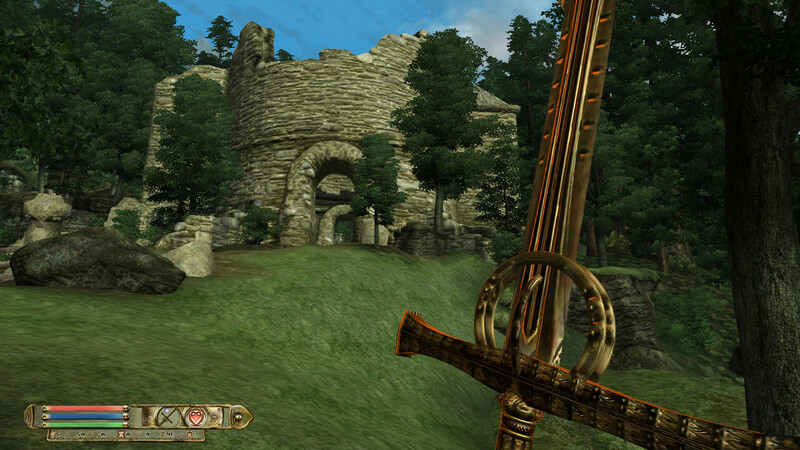 Overall, Nehrim to me feels like a big German Oblivion DLC, but its size and scope puts any Bethesda DLC to shame. So if you miss playing Oblivion and want to explore a totally new Oblivion-style world, I highly recommend Nehrim. 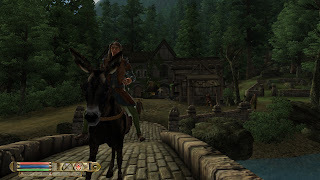 It's one of the most epic Oblivion projects I've ever seen and is definitely worth a look. Interesting concept, and one that I will eventually look into, but I have to wonder how many of my Oblivion mods will conflict with it. Guess I will have to try it out and see. Yeah, that's the other problem I neglected to mention in the post. Most English Oblivion mods won't work with Nehrim. You may have noted from my screenshots that I did manage to pull off getting the Ainmhi into Nehrim, but I still haven't figured out how to port over any decent companions (which is probably what I miss the most). Things like body replacers will work, as well as some things that alter game settings like my fast-travel mod, but most mods involving worldspaces or major quests and dialog will likely be problematic or even impossible to use without getting someone who speaks German to do a conversion. I was never really impressed by Oblivion, Morrowind was far better imho. But Nehrim topped it all. I love Nehrim, even more since it was made by modders. The best thing is, it doesn't need any additional mods, imho it's perfect as it is. I think a fast-travel mod is a cheat (you have to find certain runes to teleport around the map, and there are plenty of them). The german speech is excellent, better than Oblivions (not in sound quality, but in dialogue quality). Also i think the storyline is more interesting than Oblivions. So yeah thanks for bringing the update to my attention. I'll decide to install it or not after reading the changelog, so far i didnt encounter any serious bugs in the old Nehrim version. 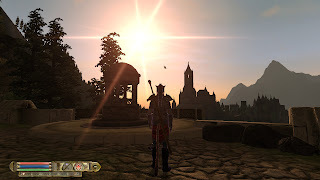 In Oblivion I consider fast-travel a cheat as well and use mods to disable it and replace that with travel services that need to be paid for or mages that will teleport me around like in Morrowind. But in that example I always have the option to turn fast-travel back on when real-life demands that I accomplish something in the game quickly rather than running across the countryside for an hour. Thus I created my fast travel mod; it's only there in case of real life time constraints. If others don't have the self-control not to use it constantly, I don't feel responsible. And I agree that Morrowind remains the best Elder Scrolls game. I think it's a shame that eye-candy lovers always get their way while other game aspects suffer and games like Morrowind get left behind. There are still some loyal Morrowind fans around, though, and still a few mods being made for it even today. OK, that makes sense, somehow... well, i'd consider using such a mod only if i already played thru the game at least once and know every place (and the areas between) by heart. What would really be neat would be a Nehrim Requiem For Cyrodiil... but I suspect that the language barrier would make that impossible as well. It would make the task rather difficult for someone that does not speak the language, but I wouldn't say impossible. And I am normally a pessimist. Machine translation, although not perfect, would help greatly in finding one's way through the inner workings of Nehrim. Knowing someone that spoke, or at least read, the language would be better, assuming that he or she would be willing to help with the project. I just installed Nehrim, it looks interesting, though my game backlog is already miles long. Yep, that's part of how I got the Ainmhi in there. Complications arise if a mod is more complex than that, however, thus I'm still unable to figure out how to port over something actually useful like CM Partners. Forgot to say, the awkward bit is how many mods are compatible but only have a single line in the readme mentioning it, if they mention it at all.